For admin panel, data entry software, CRM, CMS, we all need a design for admin panel. If you are a good designer, then you can create. But if you are not, then you need to search for a design in which you can add your custom code. In this post, we are listing 10 best admin dashboard templates built in HTML5 and CSS3. All these templates are paid but affordable. You can select any one which suits you and purchase for your next project. Metronic is one of the best admin dashboard templates available because of its lots of features. This template was built on Bootstrap 3.3.1 and comes with Angular JS and SASS support. You will also get 36 layered PSD files, 400+ page templates and 1000+ UI components with this template pack. It has 7 admin and front end themes. So, you will surely get something matching your new project. Look and feel is awesome and responsiveness makes it worth try. It’s Brain is another nice responsive Bootstrap 3 admin template which comes with awesome design and various components. It has 19 HTML pages, 300+ icons, various forms elements, dynamic tablets and 20+ plugins. I am sure you will find it relevant to your need. Angulr is a Bootstrap Admin Web Applocation template built with AngularJS. It comes with lean and attractive design, 8 color palettes, LessCSS and lazy loading. It personally like the user experience of this template. Like other templates, it also offers various UI kits, layouts, form elements, charts and tablets. FLAT is a clean responsive admin panel template based on flat design. It offers metro design look and is retina display readu. It is easy to customize with option to select from unlimited colors. You can eother use fluid design or fixed design depending on your choice. It also comes with various form elements, page templates and other UI components. Gebo is also a popular responsive two column admin template with hideable sidebar. It is based on Bootstrap framework. It comes with custom search page, charts, images and video grid, tablet and lots of js plugins. Aquincum is full responsive HTML admin panel template with 29 valid HTML pages, organized and easy to understand code, icon fonts, grid based layout, 30+ plugins and various other custom elements. FlatLab is my favorite because of its clean flat designing. It is based on Bootstrap 3.2.0 framework. It comes with huge collection of reusable UI components and integrated latest jQuery plugins. Theme is easy to customize, light weight and fast. The theme is perfect for admin dashboard, CMS, CRM and business website. This theme works perfect on all major web browsers, desktop, iPhone, iPad, Android smartphone and tablets. 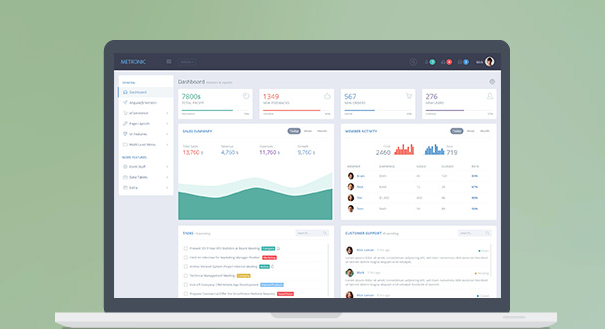 Bucket is another loved Bootstrap based flat Admin panel dashboard template. Color scheme of the template is attractive. It is responsivem customizable, and modern theme. It also comes with PSD included. This theme works on all major platforms including desktop, smartphone and tablet. You can use this template for projects like admin panel, project management, admin dashboard, CMC and CRM. With large number of widgets, you can have various features in your app. ProUI is also a multi platform supported responsive feature rich admin and front end template built on Bootstrap. It offers clean and modern design with various UI components. It can be used for admin panels, backend, CMS, portfolio, blog and business website. Bracket is another responsive bootstrap based admin tempalte which offers good user experience. It comes with 60+ responsive HTML pages design and various other UI components. It also works on fine on various screen size devices.